Two falsified versions of leukaemia drug Iclusig discovered by the authorities in Switzerland in January, have also reached other markets including Turkey and Argentina. The medicines – discovered in 15mg and 45mg tablets packs – raised the suspicions of the local wholesaler who purchased them when going through the verification process, and were subsequently confirmed to be counterfeit by the marketing authorization holder (MAH), according to a World Health Organization (WHO) alert. Iclusig (ponatinib) is used to treat adults with chronic myeloid leukaemia (CML) and acute lymphoblastic leukaemia (ALL) and was developed by Ariad Pharma, now owned by Japanese drugmaker Takeda. It is sold in Europe by Incyte Pharma under the terms of a deal signed with Ariad in 2016. Investigations by Incyte and WHO have verified that two versions of falsified Iclusig product and batch numbers are being traded in Turkey, Argentina and Switzerland, and via internet sales. Laboratory analysis of the 15mg drug found in a UK/Ireland pack (stated manufacturer Ariad) with the batch number 25A19E09, has confirmed that the product does not contain ponatinib and instead contains a low dose of paracetamol. 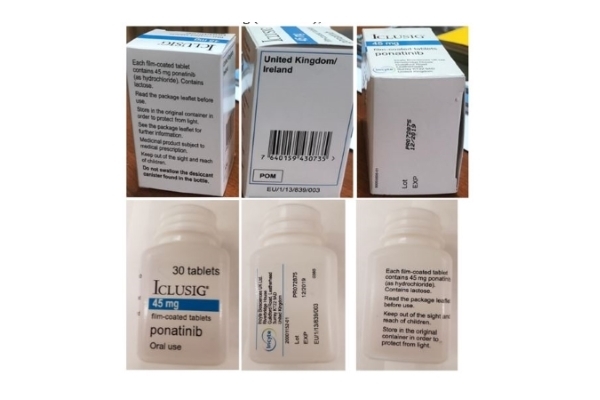 Similarly, testing of the Iclusig 45mg version, also found in a UK/Ireland pack (stated manufacturer Incyte) but with the batch number PR072875, suggest there is no ponatinib present. Takeda reported sales of 4.3bn yen (around $40m) for Iclusig in the nine-month period ending December 31m 2018, while Incyte said it booked $60m in sales of the drug in the first nine months of calendar 2018.